The objective is to install the NVIDIA drivers on Ubuntu 19.04 Disco Dingo Linux. Installed NVIDIA drivers onUbuntu 19.04 Disco Dingo Linux. 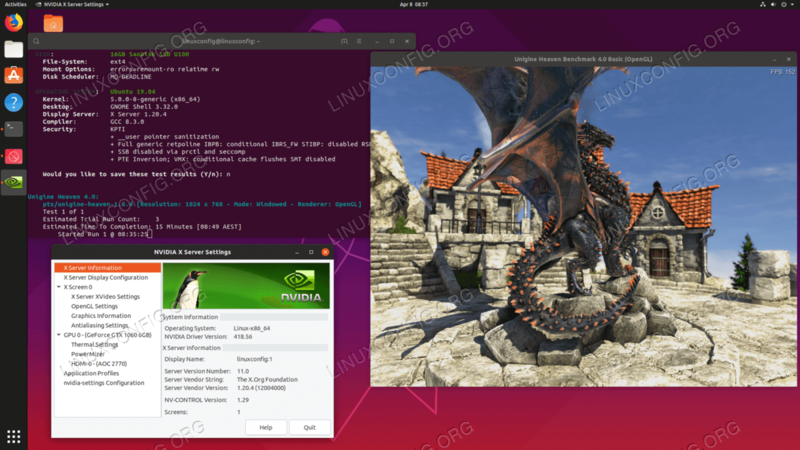 After installation, optionally run Nvidia graphic card test by following our Benchmark Your Graphics Card On Linux guide. The first method is the easiest to perform and in most cases it is the recommended approach. From the above output we can conclude that the current system has NVIDIA GeForce GTX 1060 6GB graphic card installed and the recommend driver to install is nvidia-driver-418. In this case the hird-party free drivers are behind. identify your NVIDIA VGA card. Download the Official Nvidia Driver. Using your web browser navigate to the official Nvidia website and download an appropriate driver for your Nvidia graphic card. Configure NVIDIA X Server Settings.